It’s already been a memorable 2016 for Bain Capital Ventures. Thanks to the amazing founders we get to work with, we joined some epic journeys. Some are starting new chapters within broader platforms (Jet.com teamed up with Walmart and BlueCoat joined Symantec) while the next generation of startups #BackedbyBCV are well on their way, from DocuSign and BloomReach to ZenReach and RedisLabs. With that surge of results and momentum, we closed our new 2016 fund and opened our new SF HQ. But let’s pick up the story a little earlier and introduce ourselves. Bain Capital started in 1984 as a VC and growth equity fund (early investments included a seed check in Staples). Our results and growth through the 80s and 90s enabled us to build world class private equity, hedge fund, and credit businesses. Bain Capital Ventures was born in 2001 out of a desire to double down on our early stage roots. Over the past fifteen years, BCV has stayed true to our mission – leverage deep sector expertise, unparalleled Fortune 5000 access and a passionate team of investors to empower talented entrepreneurs, especially in B2B startups. That mission led us to some amazing companies: LinkedIn (NYSE: LNKD), SolarWinds (NYSE: SWI), Survey Monkey, Taleo (Nasdaq: TLEO), Kiva Systems, Rapid7 (Nasdaq: RPD), Ability Networks and TellApart, to name a few favorite alumni. In 2011, we launched our west coast office. Five years later, 50% of our partners and dollars deployed are here. Our Bay Area team is fired up to help founders harness the full power of the Bain Capital ecosystem. It’s why we host Pulse sessions (bespoke demo days) for CXOs from Staples, Neiman Marcus, RBC, Citigroup and many others. It’s why Jeff Williams joined our team. In short, we love what we do and are excited to write another chapter of our own. That’s where you come in. Investing in startups is fundamentally about recognizing exceptional talent. The same is true for our own team. We are looking for 2 exceptional people to join our investment team as associates. One associate will work with our infrastructure software team (Enrique, Salil, Jeff) and the other will work with our application software team (Ajay and Indy). Your mission will be to help us connect with and build another wave of #backedbyBCV companies at the Series A stage. And support those founders on everything from hiring to product strategy. It’s an amazingly dynamic and impactful role. Analytical experience in a biz ops / finance role, strategy consulting role, etc. 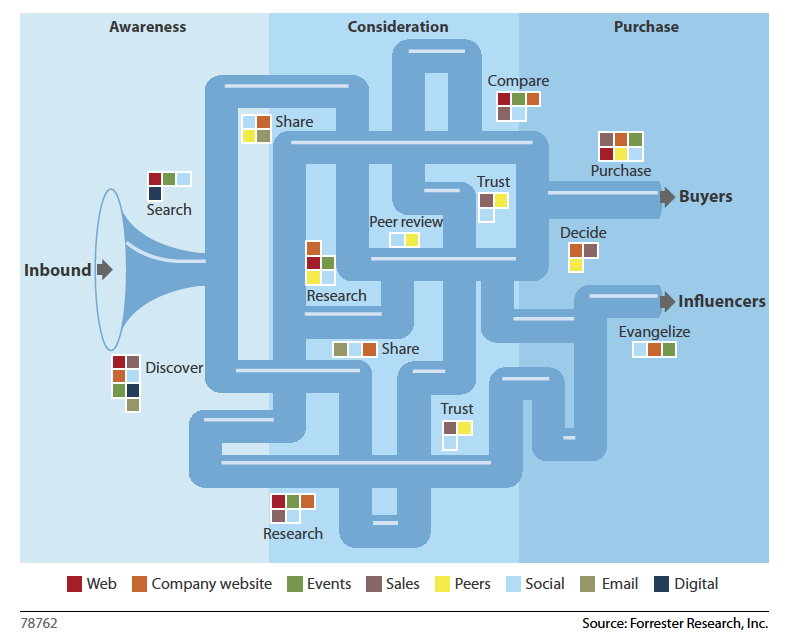 You have a foundation in understanding business models and levers for growth. Startup experience. You can’t be an empathetic guide if you’ve never been on a similar journey. Tireless intellectual curiosity. Young companies operate in a world of unknowns around product, business model and market fit. Being thoughtful and creative about getting to the right answers matters. Connectivity. Tech is a deep and wonderful community. You want to embrace and contribute to that community via product deep dives / workshops / dinners / meetups / blog posts / etc. Passion. Founders rightfully expect a lot from the VC firms they partner with. Delivering to those standards can require long hours. Your passion for enabling founders will be directly proportional to your impact. What should you do to connect? If you’re excited about joining our team, we’d love to hear from you. But instead of using a search firm or an application page on our website, we’d like to take a different approach. Step 1 – get a warm intro to our west coast team. No cold emails please. Your ability to develop and activate a network is a big part of this role. We’d love to see you showcase that skill. A specific company you’d want to back within that theme (caveat: total funding in that company should be less than $20 million) and what makes it the right bet. The long term exit potential for that company. Step 3 – (for candidates who stand-out in step 1 and 2) in-person meetings with our team. This is your invitation. We couldn’t be more excited to kick off this search and add 2 great people to our team over the next few months. Come find us – we can’t wait to meet you. Ajay, Enrique, Salil, Jeff, Indy and the BCV CA Team! Today Wrike announced a $15MM Series B round led by Scale Venture Partners. Here are some reflections on how the company has grown in the 1.5 years since BCV led the A round. I met Andrew, the CEO of Wrike, in the summer of 2013. He had already built Wrike into a company with over 4,000 customers and several million in revenue and he had done it with no institutional capital. And he still found time for side projects like robotics competitions.The depth and range of his talent and drive was immediately obvious. So we backed him at the A round. In addition to the team, our excitement had a lot to do with customer engagement. Here’s the graphic from my blog post after the Series A funding. Fast-forwarding 1.5 years, the fundamental quality of the product – and the resulting customer engagement – has gone from strength to strength. Over 8,000 accounts now use Wrike! A big part of the growth has been a new enterprise product, which allows Wrike to be one of the few work management solutions that scales for 100+ person teams. It’s allowed us to serve customers like Adobe, Paypal and Sony. And has led to incredible growth in the past year. BCV has had incredible success backing companies with bottom-up adoption, from LinkedIn to SurveyMonkey to SolarWinds. Rory O’Driscoll and Scale, having invested in companies like Box and DocuSign, also understand the power and momentum of this groundswell of adoption. Along with DCM, we are backing Wrike to become another important pillar in the new work cloud as they ride someincredible tailwinds in enterprise collaboration. So congrats to Andrew and the Wrike team on another milestone in an amazing journey. We at Bain Capital Ventures are incredibly proud of you for what you’ve already accomplished, and very excited to support you in the journey ahead. My thoughts on VentureBeat around the “Revenue Pit-Crew”, a growth technology stack for marketers and sales leaders. Many of you have reached out to me asking for the source data in this post. Since it’s based on an internal analysis we did at Bain Capital Ventures, I thought I’d share the updated version of the data. 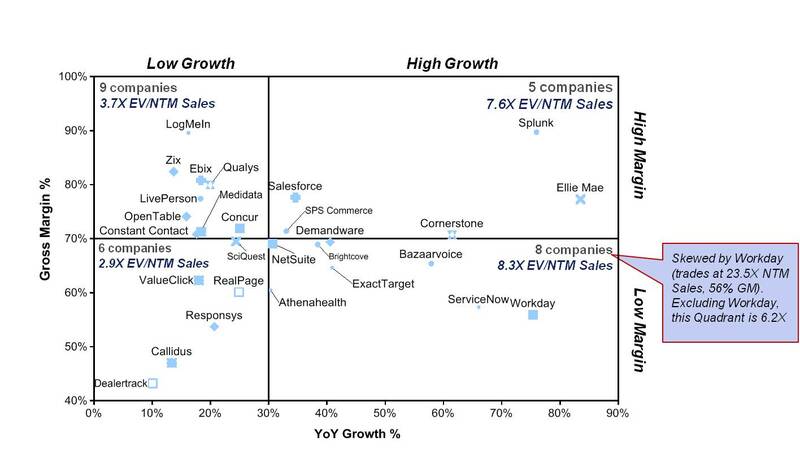 In short, looking across all public SaaS Co’s, high growth (>30% YoY), high gross margin (>70%) companies trade at 7.6X Enterprise Value / Next Twelve Months (EV/NTM) Sales, vs. industry wide average of 5.5X. And growth rate matters more than gross margin. The top-left quadrant (low growth, high gross margin) trades at 3.7X. The bottom right quadrant (high growth, low gross margin) trades at 6.2X, if you strip out Workday.